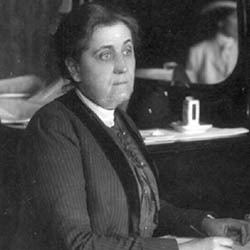 JANE ADDAMS SAYS THEIR FIELD FOR BADNESS IS SMALL. Lack Same Opportunities as Men for Bribing Legislators, Etc. -- Address Before the Chicago Business [Women's] Club on Philanthropy -- Speaker Holds That Lack of Franchise Gives an Excellent Opportunity to Work Among the Poor Down-Town. 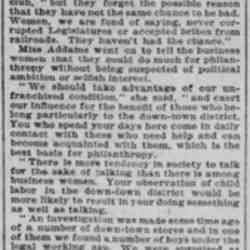 "Women consider themselves better than men," said Miss Jane Addams last night, in addressing the Chicago Business [Women's] Club, "but they forget the possible reason that they have not the same chance to be bad. Women, we are fond of saying, never corrupted Legislatures or accepted bribes from railroads. They haven't had the chance." Miss Addams went on to tell the business women that they could do much for philanthropy without being suspected of political ambition or selfish interest. "We should take advantage of our unfranchised condition," she said, "and exert our influence for the benefit of those who belong particularly to the down-town district. You who spend your days here come in daily contact with those who need help and can become acquainted with them, which is the best basis for philanthropy. "There is more tendency in society to talk for the sake of talking than there is among business women. Your observation of child labor in the down-town district would be more likely to result in your doing something as well as talking. "An investigation was made some time ago of a number of down-town stores and in one of them we found a number of boys under the legal working age. We were surprised at the explanation the proprietor gave for employing them. He said he did not care to take boys so young, but he had taken them at the earnest solicitation of some charitable women who explained the needs of the family. They wanted the boys to get wages." Miss Addams said she had become more opposed to child labor than she was when she first went into settlement work. It is because she has seen the boys and girls, who were employed then, grow up to men and women, and found out what premature work means. It is premature work, she says, that is largely responsible for tramps. Miss Addams said one trouble in Chicago is that the compulsory education law sadly needs enforcing. It is a difficult thing to do, she said, and the department uses its influence to try to keep children in school. 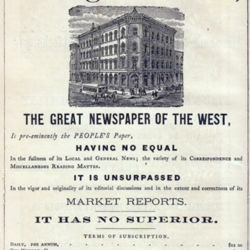 She prophesied that within twenty-five years people would wonder that boys of 7 and 8 years were ever allowed to risk their physical lives, their moral welfare, and their future prospects by selling papers on the down-town streets. Why Women Are So Good, Chicago Daily Tribune, November 20, 1902, p. 7. 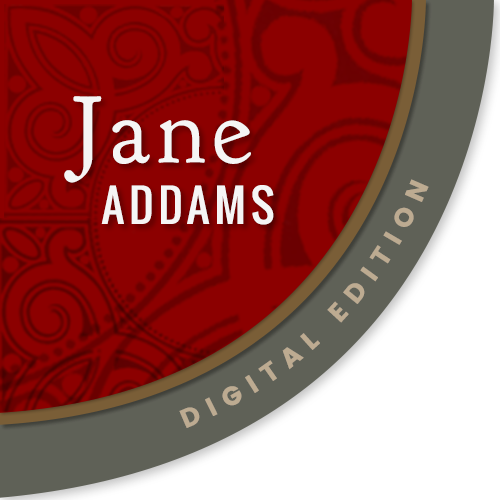 Addams, Jane, “Speech to the Chicago Business Woman's Club, November 19, 1902 (excerpts),” Jane Addams Digital Edition, accessed April 25, 2019, https://digital.janeaddams.ramapo.edu/items/show/16913.